This is a rectangle Army Air Corps porcelain sign. This particular Army Air Corps sign is predominantly white with red and blue text. 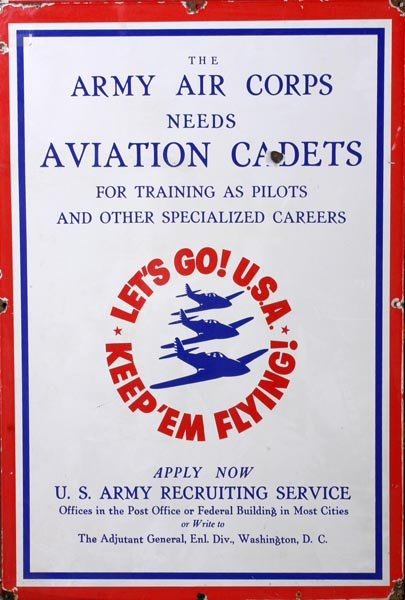 It reads, “The Army Air Corps Needs Aviation Cadets For Training As Pilots And Other Specialized Careers, Let’s Go! USA Keep ‘Em Flying, Apply Now, US Army Recruiting Service, Offices in the Post Office or Federal Building in Most Cities or Write to The Adjutant General, Enl. Div., Washington, DC” and features blue fighter planes in the center.